Waltz through the elegant hallways, ornate interiors, and Victorian-era architecture of the historical 1892 Bishop’s Palace on Galveston Island. Towering over the intersection of Broadway Avenue J and 14th Street, Bishop’s Palace asserts its presence to anyone who happens to pass by. The work of architect Nicholas J. Clayton, the building cuts an imposing yet beautiful figure composed of varied layers of colored stone, wrought iron-lined terraces, and a plethora of windows punctuated by crimson. For $12, you’ll be granted access to the mansion along with a comprehensive self-guided audio tour. 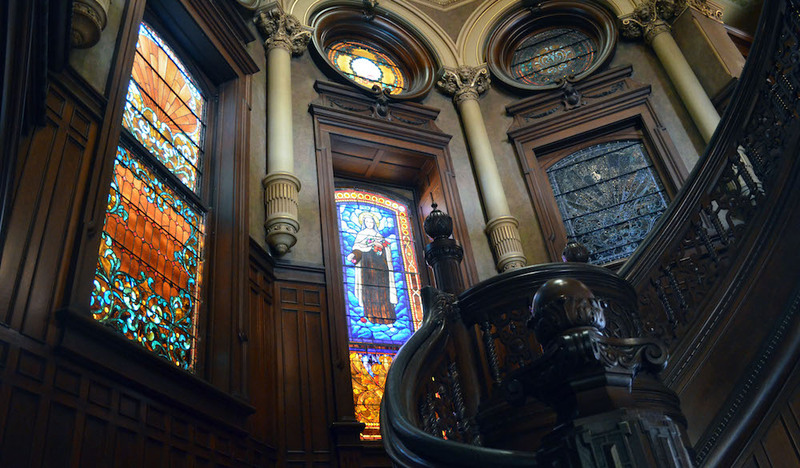 From here, you climb a narrow set of stairs that ascends into the main foyer where you’re immediately greeted by a grand red-carpeted staircase bracketed in rich, dark wood that scales up into vibrant stained glass windows and a vaulted rotunda. It’s a place that you’ll need to take a few minutes to study, taking in its innumerous decoratively carved details — and that’s only the first room. For ticket and tour information call 409-762-2475. With over fifty rooms spread across three floors, Bishop’s Palace began as the residence of Walter Gresham, a one-time Confederate soldier and Congressional Representative, and his wife, Josephine, along with their nine children. For over twenty years, their home served as a place to entertain, impress, and even shelter as it did for hundreds of people during the infamous Storm of 1900 on Galveston Island. Amidst carved wood-paneled walls decorated by the pastoral painting of his wife and father-in-law, Walter Gresham made sure his 20,000 square foot home would become one of the most elegant throughout the state of Texas. After Gresham’s death in 1920, the home was sold to the Roman Catholic Diocese of Galveston where it served as a residence for Bishop Christopher E. Byrne, across the street from Sacred Heart Church. 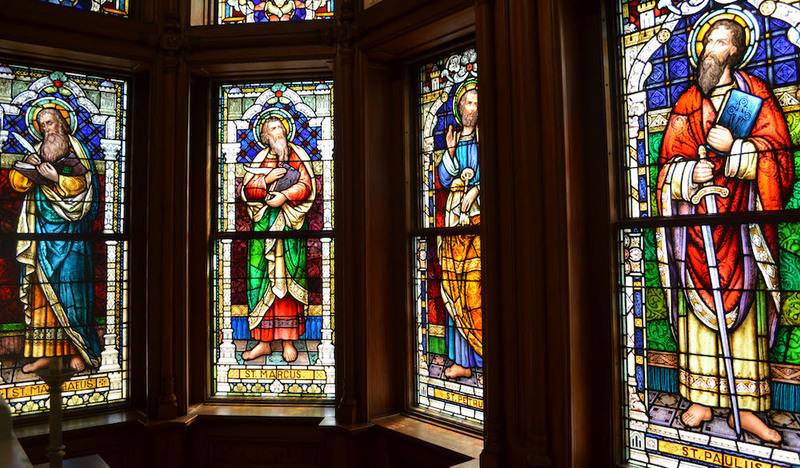 As a remnant of the Bishop’s time, the second floor features an understated chapel that floods with a colorful kaleidoscope of light shining through stained glass images of saints on the far wall. Finally, once the offices of the diocese were moved to Houston in 1963, the Bishop’s Palace was opened to the public, where it has remained one of Galveston’s must-see attractions ever since. Shuffling through the mansion, you’ll find no shortage of photo opportunities whether you’re in Gresham’s office alongside his marble-topped desk, or in the nearby music room where a century-old piano sits next to a silver-lined fireplace or one of the sparse bedrooms where outside light pours in to highlight various features of the Palace. With the help of the audio tour, you’ll find yourself unraveling the history of Bishop’s Palace with every step. While the self-guided tour makes for an hour of enlightening information, private tours are also available for $50 (regular) and $80 (behind-the-scenes). These private tours provide additional information and also allow access to more areas of the mansion, including the uppermost story that features Josephine Gresham’s art studio. Reservations are required and must be made one week in advance. An extensive gift shop takes over the basement floor of the Palace, offering guests a chance to purchase many unique Galveston-themed souvenirs. Bishop’s Palace is currently not wheelchair accessible. While they hope to make the mansion tours special needs accessible in the future, they currently can offer photography and written tour information as they work to provide better access for those with physical disabilities. Admission: $12 self-guided audio tour; $50 guided tour; $80 behind-the-scenes guided tour. For ticket and tour information call 409-762-2475.